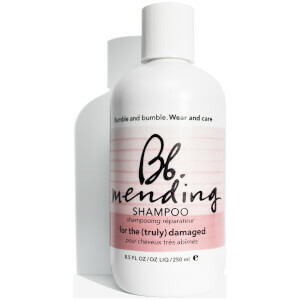 Packed with a supercharged formula, Bumble and bumble Wear And Care Mending Shampoo repairs chemically damaged hair to give back strength, shine and protection to your hair. I think the Bumble & Bumble Wear And Care Mending Shampoo (250ml) is working some magic. My coloured, fine hair feels and looks healthier and stronger after a couple weeks use! It really does what it says on the bottle! If your hair is dry and damaged from years of dying and straightening, fear no more! This really is the ultimate product, even after the first wash with shampoo and conditioner you see and feel the difference. At a great price in comparison to other retailers I really couldn't big this up anymore. It really works and I love it!